Stuffed French Toast- Now Served All Day! Stuffed French Toast is so good it should be an anytime treat, so come on in to the Brownstone Cafe, where we are now serving up your favorite Stuffed French Toast all day! 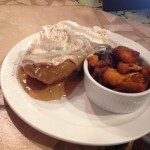 Come taste the sweet S’mores Stuffed French Toast or the delightful Peach Paradise! Don’t forget to explore the Brownstown Newsletter for the month of August. Check out our monthly recipies, coupons, and more! Check out the Brownstone Cafe’s monthly newsletter! Complete with recipes, coupons, and more!